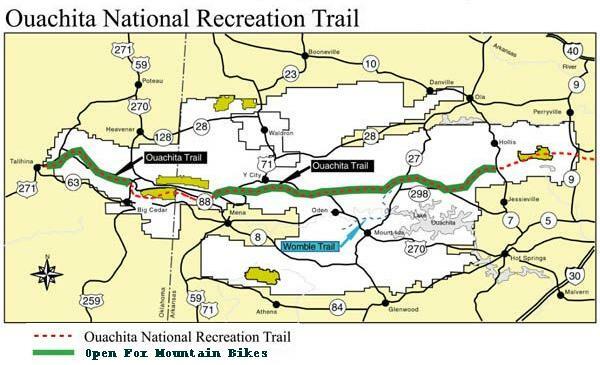 In May, 2001 the Ouachita National Forest Supervisor opened 137 miles of the Ouachita Trail to use by mountain bikes. Elevations range from 600 to 2,600 feet as the trail passes through forested mountains, across sweeping valleys and near clear -running streams. Spur trails connect to various recreation areas and points of interest. Numerous road crossings and access points provide opportunities for point to point mountain bike rides of various distances. For more information, you may purchase a detailed map at all Ouachita National Forest offices. Check out the Ouachita Challenge 60 mile Tour at www.ouachitachallenge.com. The Ouachita Trail will provide access to many recreation facilities. The Talihina State Park in Talihina, Oklahoma is the westernmost trailhead of the Ouachita Trail providing access to the Military Road trail spur. Traveling west on the Ouachita Trail will bring you to the Cedar Lake Trail Complex with the HorseTheif Springs Trail spur. Cedar Lake Recreation Area offers a 90-acre lake for swimming and fishing. In Arkansas, you will have access to the Big Brushy Trail Complex and access to the Womble Trail spur. Access the Ouachita Trail at the Talihina State Park in Talihina, Oklahoma, or at the Horse Thief Springs trailhead on the Talimena Scenic Drive, or at the Big Cedar Trailhead on Highway 259. Further east you can access the Ouachita Trail again from the Talimena Scenic drive west of the Queen Wilhelmina State Park. Access also from the Mountain Fork Trailhead in the Rich Mountain Community on Hwy 270 or from the Hwy 71 Trailhead South of Mena, Arkansas. Continuing west a very popular access point is the Big Brushy Recreation Area. Trailhead access also at Hwy 27 and finally at Hwy 7. We now have 137 miles of the Ouachita Trail open for Mountain Bike use. For rider that are interested in riding the Ouachita Trail, I would caution that in comparison to lets say the Womble Trail, the Ouachita Trail presents a more challenging trail. If you have never ridden the Ouachita Trail, I would suggest that you first ride the areas that were open for study in 1998. This would be from Hwy 71 to Hwy 27. This 58 mile section served as the test area, and has benefited from the increased usage and increased trail maintenance by local cycling clubs. The rest of the new trail that has been opened is best to be left for the more adventurous riders willing to encounter unimproved trail conditions. These new sections will improve with time, and use and maintenance. 2. Emerald Springs at the Talimena Scenic Drive heading East to the Big Cedar Trailhead. 3. Mountain Fork Trailhead on Hwy 270 to Highway 72.